When I yesterday posted about the personalized Into The Nights-offers and asked readers to post theirs (read more and post yours here), I couldn’t reveal what the base line offer for new accounts is as the registration system was down. The headline for this promotion is that you can get 50,000 bonus points, 2 free nights or 10,000 airline miles and the base offer confirms this. So, you can complete the promotion after having just 3 stays with IHG of which 2 must be at different Holiday Inn hotels, the stays must include two Saturdays and you must book at least 2 stays at IHG’s websites or mobile apps. You also must also log into the Android or iPhone app at least once. Taking these actions would earn you 4,500 bonus points from this offer in addition to the points that you earn from the stays. 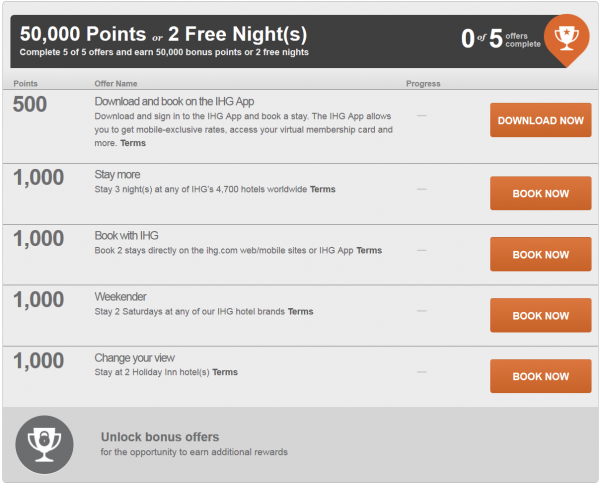 Then you can choose between 50,000 bonus points OR 2 free nights that are valid at all IHG hotels (theoretically up to 100,000 bonus points value if used at 50,000 points per night properties). Remember that you can exchange IHG Rewards Club points to airline miles at 5:1 ratio, so 50,000 bonus points converts to 10,000 airline miles. This is a fantastic offer for those that want to get started with the IHG Rewards Club. You can get two free nights that you can use at any IHG property worldwide by just having 3 stays. These free nights are in addition to the Into The Nights hurdle bonus points, other bonuses and base points that you would earn. Next articleDid United Cheat On Its Buy Miles Bonus?